Apostrophe as Indication of Time or Quantity. Let us begin by looking at the definition or description (if you will) of an apostrophe and then proceed to look at its various uses with copious examples and then where not to use the apostrophe. Shall we? This is a mark that we use to indicate possession and to show the contraction of some words. I’ll be with you in a jiffy. I’d like two wraps of fufu. Don’t you think it’s silly! We’re at the middle of something. Daren’t any you argue the matter with me! See the Modal Auxiliary Verbs and Non-Modal Auxiliary Verbs for their contracted forms. His house is a stone’s throw away. The game is anybody’s game. Someone’s car is blocking the road. The creche has many children’s toys. There is a couples’ forum in my church. The boys’ and girls’ hostels are congested. You can find her at the teachers’ corner. I followed to Captain to the Officers’ Mess. Nicholas’ Hospital is one of the best. Somebody’s car must be available for this emergency. St. James’ Cathedral is a big one. Jesus’ priesthood is of an eternal order. The Israelites celebrated Moses’ parting of the Red Sea. Philippa Jones’s book is interesting. But when it comes to names from the ancient world, the ‘s’ is not required after the Apostrophe as in Achilles’ heel. But for Jesus, there is always an exception – there is no need to add ‘s’ as in Jesus’ disciples, Jesus’ name. I will arrive in one week’s time. She will need six yards’ worth of material to sow the dress. Voter cards collection ends in two weeks’ time. Card readers will be shipped out in three months’ time. In two days’ time, everything will be over. There are two c’s and two m’s in the word, ‘accommodation’. The word ‘embarrassment’ has two r’s and two s’s. In the Scrabble game, q’s are so scarce. Many English words do not have x’s. The a’s are part of the most used letters of the English alphabet. He usually spells Philip with two l’s instead of one. All DVDs play on the machine. The countries’ GDPs are low. We saved the work on different CDs. Quintessential class of ’08 remains the best graduating class. America was in depression in the ‘30s. The African Continent witnessed the gale of independence in the ‘60s. The movement gained popularity in the late ‘60s and early ‘70s. The Faith movement began in Nigeria in the ‘80s. In the early ‘70s, the society was saner than this. The hairstyle was popular in the ‘40s. No soldier dare ignores the commander-in-chief’s orders. The Editor-in-chief’s news report was not properly covered. The sergeant-at-arms’ daughter came visiting. The children’s nanny is here. The workers’ union is planning an industrial action over minimum wage. Girls’ hostel is a lot cleaner than boys’ hostel in the school. Students’ shoes are expensive these days. The clowns’ dresses have variegated colours. The schools’ representatives were all present for the games. In this part of the country, families’ houses are unusually spacious. The air hostesses’ dinner gowns were ruined by the drink. Her parents’ car needs to be repainted. The wind blew away the musicians’ sheets during the outdoor concert. The puppies’ pen needs cleaning. It is proper to remove cherries’ pits before using them to make pie. We have blocked all the mice’s holes and destroyed their nests. Michael and Grace’s car is becoming old. Shawn, Tony and Joseph’s house has been put up for sale. Get me a copy of Bloor and Bloor’s book. Sammy and Jane’s car was towed away. The teacher’s and the student’s views are not in alignment. Pete’s and John’s laptops are missing. Sammy’s and Jane’s cars were towed away. Elliot’s and Eugene’s phones are outside network coverage. Gretchen’s and Gina’s luggage came three days after their arrival. It is said that the apostrophe is one of the punctuation marks commonly misused, misplaced, and misunderstood! The word Your is a possessive pronoun but You’re is a contracted form of You are. This word Its is a possessive pronoun while It’s is a contracted for of It is. When you look at the word Whose, it equally symbolises possession while Who’s is the contracted form of Who is. I know who’s coming to town. Read more on the use of Whose and Who’s. Does the word own something? Is this word a contraction of two words? If the answers to these two questions are in the affirmative, you might consider using an apostrophe within the various contexts of use we have talked about above. You must also note that apostrophes are not markers of the plural form of the noun. Never use an apostrophe before the ‘s’ in the plural of dates. 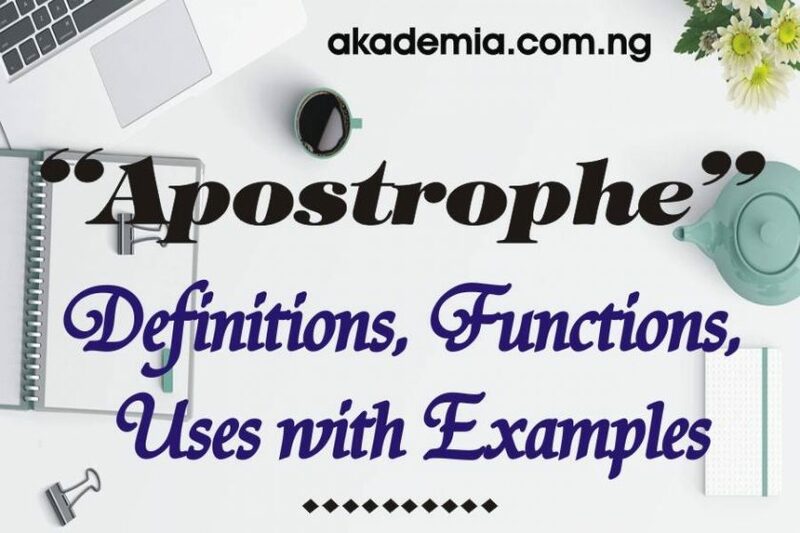 I am pretty sure you have learned a whole lot of useful information from this post, Apostrophe – Definitions, Functions, Uses with Examples. There are other punctuation marks you need to learn about; do not deny yourself the opportunity of checking them out and sharing the useful items of information with others. Remember to connect us on our Social Media platforms. See you around. Write up is very good. Syles in writing, mechanics/punctuation and their uses all of these should have been in a booklet form. Working on that, Abdulai. Thanks, for mentioning it.